While traveling up False River on the Jersey Island Ferry, the sun and ground fog created a great opportunity for an unusual photo. Ducks and geese worked our decoys all day today. Hunting with my son-in-law Brett was about as good as it gets. It was his third waterfowl hunt, but the first time that he had numerous chances. After a few failed attempts, Brett brought down this spec that set on our goose decoys. 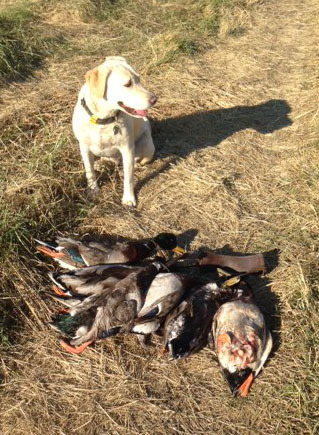 Lola made eight good retrieves on specs and pintail. Brett snapped this photo of Lola up close. Brett knocked down this drake spring on his last shot of the day. A monoculture creates habitat for a few while denying many. Take my yard for example. It’s a 20-year-old garden, neatly manicured and primarily consisting off mature trees and shrubbery. The trees are mostly large red-woods, live oaks and ornamentals. The dominant animal species is a non-native Eastern tree squirrel. My wife put out a bird feeder. I’ve seen two species of birds perched on it – often a black phoebe that uses it as a lookout and once an English sparrow. Birds don’t spend time in our yard because it has little to offer them. They’re too busy out in the weed lot where seeds are plentiful instead of our yard which doesn’t have a plant in it that produces seeds. We have a few insects, but not many. When my wife sees a bug she terminates it. I guess you could say this is Linda habitat. What creates a monoculture? Single minded people and organizations with a narrow objective. Who’s the biggest creator of monoculture? Probably agricultural interests and timber companies. Farmers envision row crops as far as the eye can see. Ranchers manage only for plants the cattle can eat. Everybody has an objective and most often it doesn’t include leaving anything behind for wildlife. And, sometimes government creates monoculture – like the U.S. Forest Service. A few years after a potentially beneficial forest fire, bulldozers remove the remains of old trees and then plant seedlings. After a year or two, when other plant species appear, herbicides are used to kill them. Shrubs, like ceanothus, that could create diversity are not allowed to compete with the success of the new pine forest. A monoculture of trees emerges from the ground. Deer and other wildlife that could have benefited from the fire are denied. Why do we have to be so efficient? Government lays the groundwork for a monoculture when it passes legislation specifically intended to benefit one animal species deemed to need special consideration. Efforts to offset carbon emissions can create a monoculture in the form of old growth habitat intended to offset carbon emissions (Cap-And-Trade). When farmers plant many thousands of acres of corn, a few species benefit and many others disappear. Some game animals benefit from cornfields, because corn produces food. But, when farming becomes super efficient, even game animals lose. Thousands of acres of rice can benefit ducks and geese, but when the rice farming becomes so efficient that it leaves no residual rice for waterfowl to eat, the rice-farm monoculture fails wildlife completely. When the government decided to go big with ethanol production, marginal habitat in the corn states was drained to expand corn production. The result, an even larger monoculture of ground unable to support waterfowl nesting. To my eyes, ethanol is a blight. Natural forces like fire create can monoculture. Sometimes a fire-created monoculture lasts only for a short time. After one season diversity may set in again and wildlife can benefit. On the other hand, when a fire creates a mountain covered only in only cheat grass, which perpetuates itself, the monoculture creates a downward spiral for species that need shrub habitat. This is one of the reasons why wildfire has severely impacted mule deer and sage grouse populations in Nevada. Because humans have create monocultures they also create wildlife winners and losers. Those who control the land and land management, control habitat on a large-scale and ultimately determine what critters will thrive and which will disappear. In the habitat world, the antithesis of monoculture is diversity. Christmas at our house is much like many others, but the influence of duck season is probably quite a bit more evident. Most of the presents I hand out to the males of the family have a strong tie to hunting – especially duck hunting as that’s what’s going on. This year I not only purchased a couple ducks calls to give away, but also dug up a few of my used calls to hand out as well. I’d rather give them to relatives than sell them cheap at a garage sale. A new hunting vest and a couple hunting books will be handed out as well. MDF provided an item. I couldn’t afford to give anybody a new rifle, so instead I’m giving out raffle tickets with a 1/100 chance to win a new rifle. Maybe one of my family will win, but they won’t find out until our March 14th fundraiser. 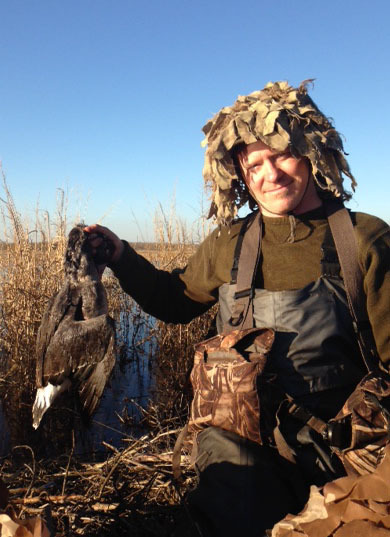 Not only do gifts enter into the equation, but so does duck hunting itself. Although my wife, Linda, is not keen about it, the 26th is a traditional duck day in our family. This year four of the family will be out in the field on the day after Chrismas. My son-in-law is our newest hunter. 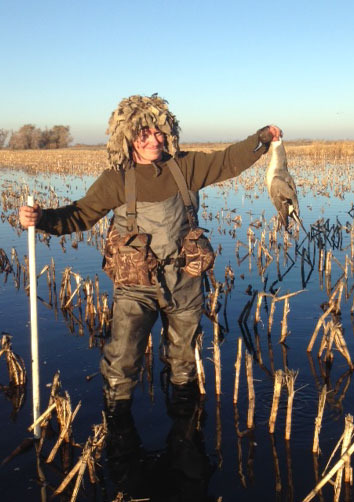 Brett bagged a blacktail last August, but he’s still looking to bag his first duck or goose. And, we all are praying for healthy new duck hunter as my daughter, Betsy, is expecting a new hunter to arrive any day. We know the baby will be a boy and I bet he’ll be a duck hunter. This is definitely a special Christmas. Yesterday’s hunt with my friend Jeff Kerry was thought-provoking. As is usual when we hunt together, we spent much of our time discussing waterfowl and waterfowl conservation. We are both very concerned about the future of waterfowl and waterfowl hunting. Jeff and I met because we are both real estate brokers and hunters. Our first interaction was in a real estate transaction where he represented the seller and I represented the buyer of a grasslands duck club. We had so much in common that it was natural for us to become friends. There is nobody who I know of who is more passionate or knowledgable about duck clubs in California than Jeff. He has the hands-on knowledge of managing habitat and experience dealing with people in both the private and public sector. One thing Jeff and I agree on is that we have spent much of our life trying to make a difference in conservation and we both have the feeling that we have not been able to make a significant difference. The forces of politics, economy and the human expansion are too overwhelming for most individuals to deal with. When I looked up Conservation in North American on Wikipedia (http://en.wikipedia.org/wiki/Conservation_in_the_United_States), I came upon some familiar names and some unfamiliar. But I believe that for the purposes of discussion, it is helpful to break conservation in North America into three centuries. The first century included developing an awareness of the impact of man upon nature. As a hunter, my view of conservation is slanted towards those who laid groundwork for and development of the North American Model of Wildlife Conservation. Two of the most prominent individuals in that arena are Aldo Leopold and Theodore Roosevelt. Among non-hunters two of the most prominent people I have been aware of are Henry David Thoreau and John Muir. Hunters or not, the emphasis on their work is oriented to habitat conservation and environmental health. The men mentioned above, and many others, established principles that guided the creators of many modern conservation organizations – organizations that helped determine the theme of the second century of Conservation. A few examples of these groups are The Sierra Club, The Nature Conservancy, Ducks Unlimited, The Wildlife Society and The Boone and Crockett Club. These are some of the organizations that I grew up hearing about. The Endangered Species Act (ESA) has become the most powerful wildlife force in modern conservation. The reason it is powerful is because it gives the government teeth so the law can be enforced. Like all legislation that expands the powers of government, the ESA is like a double-edged sword. It cuts in both positive and negative directions. The way all this relates to yesterday, is that my discussion with Jeff yesterday often clarified some of the negatives of the ESA and how those negatives impact waterfowl and the North American Model of Wildlife Conservation. As I’ve pointed out before, I believe that one of the crucial weak links in the ESA is that is too strongly protects the life of individual animals. By so strongly defending the “take” of an individual, wildlife managers are ham-strung while managing for all species. This greatly impacts waterfowl managers. For example, plowing, mowing, predator management and herbicide use are all important aspects of successful waterfowl management. However these activities are most often precluded in areas managed for endangered species such as snakes, frogs and salamanders. As more and more resources are dedicated to, or impacted by, management of endangered species, waterfowl species are declining. Sometimes this is due to an inability to manage effectively for waterfowl. Marsh intended for but not properly managed for waterfowl has little benefit to the birds. Another problem is efforts to offset carbon emissions (http://www.huffingtonpost.com/2013/11/14/california-carbon-offset-cap-and-trade_n_4270248.html), such as the prototype program at Mayberry. 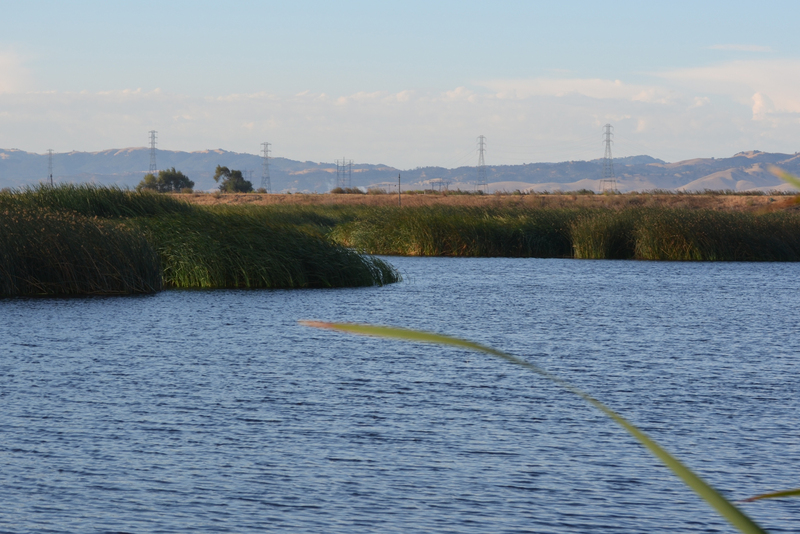 Our Mayberry duck club is being managed for carbon offsets (another form of conservation authorized by Cap-and-Trade legislation) and also as a way of preventing subsidence (ground settling due to oxidation of highly organic soils). It is my belief that this prototype is too radical and those who support it are too single-minded. Mayberry was more environmentally sound before it was converted to growing cattail. The duck club was offsetting carbon emissions and subsidence before it was converted and it was also having a tremendous benefit for waterfowl. Today Mayberry probably produces greater carbon offset and subsidence prevention than it did as a duck club, but it has almost no benefit to waterfowl. Not only is the benefit for migrating waterfowl in winter gone, but the expected benefit to nesting waterfowl in spring has proved to be negligent. The next phase of the Mayberry prototype is to expand it to other areas. 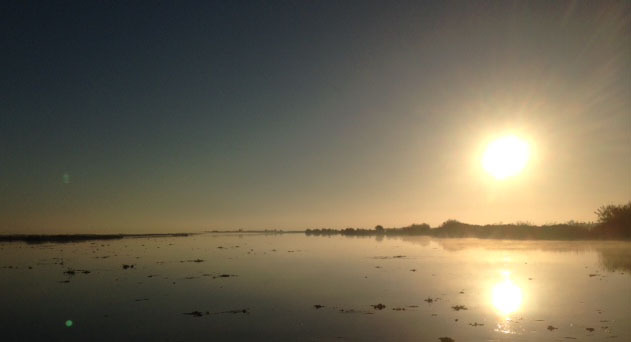 The success of the Mayberry prototype is that it has proved that this type carbon-subsidence project can be better provided by the benefits of traditional waterfowl habitat and this radical program should not continue in its current form. 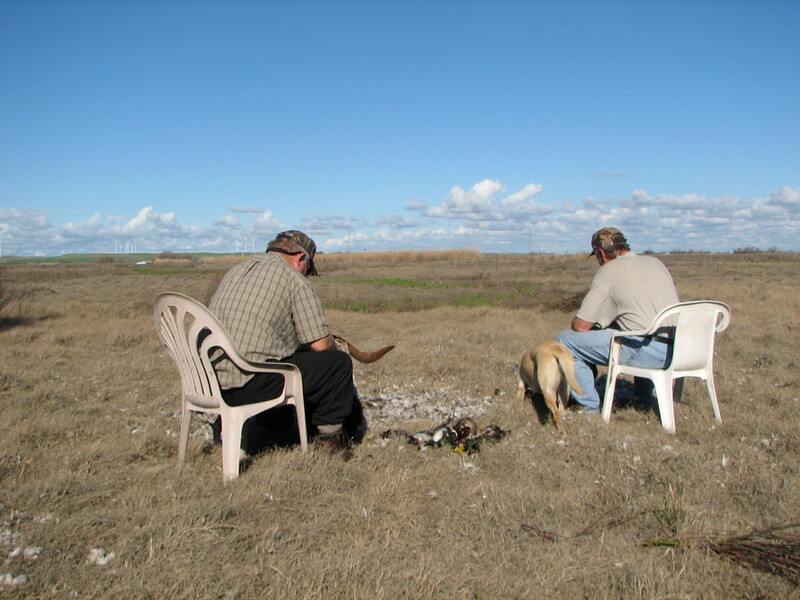 In this photo from 2010, Rob and Wes are plucking ducks facing the Mayberry Marsh as it was in 2010. 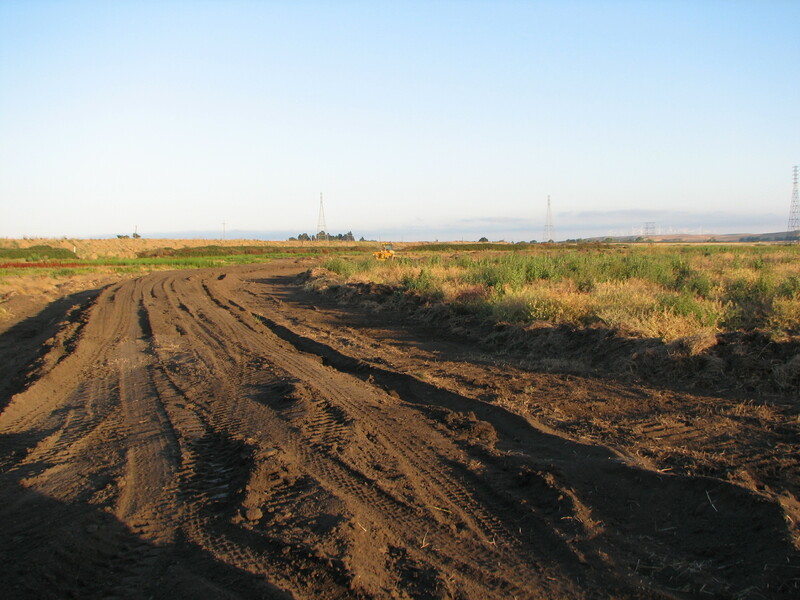 In 2011, work began to rebuild to create a permanent marsh designed for carbon offsets and subsidence prevention. Mayberry 2012 is a paradise for fish, blackbirds and cattail, but not waterfowl. Over time, conservation efforts take dips and turns and not all of our ideas result in a net gain. Before taking actions that penalize one species for the benefit of another, we need to be sure it’s worth it. And, before we go berserk worrying about global warming, we need to carefully evaluate programs like Cap-And-Trade – which will have many unintended and sometimes destructive, consequences. Today’s experience was similar to my previous hunts from rice-check blinds, except we didn’t really see a lot of waterfowl, at least nothing exceptional. White-front geese passed over and a few ducks worked the decoys. We fired at a spoony, a greenwing teal, a hen mallard and a pintail. We came home with nothing.The hen mallard sailed down a check away from us, but it got up and flew away when my friend caught up with it. Unfortunately, his follow-up shot missed and then his gun jammed. Bummer. The club we hunted today has a good reputation for success and blinds are $3,000 per hole ($9,000 for a three-man blind). A good two-man blind in the grasslands goes for about $7,500. You can kill more geese and mallards in the north, but the teal-oriented grasslands clubs can be very consistent. 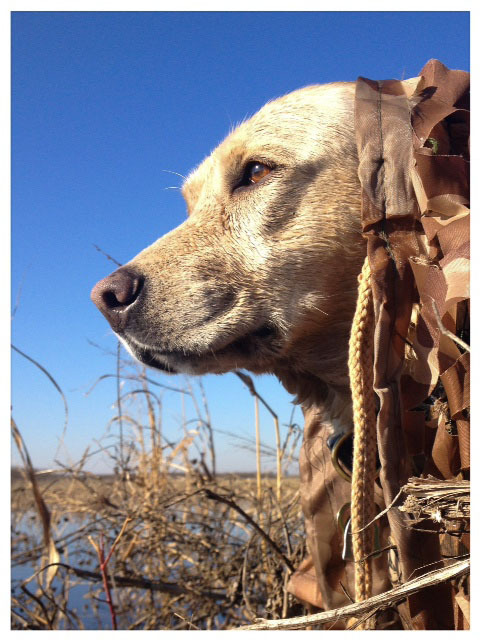 Rice ground does produce some good hunting, but it’s primarily during prime duck-hunting weather – storms, wind or fog. On nice days, like today, rice typically does not hunt well. One of my hunting partners commented that rice harvesters are so efficient now that very little rice stays in the fields, reducing significantly the attraction for feeding ducks. We stopped by Mayberry on the way home and one of our group had killed a few ducks this morning, including a couple mallards. Nothing great, but at least they got something. It was the first time my guest had seen Mayberry since the conversion to permanent marsh. He was a shocked. Anybody who knows what a good marsh looks like would agree that the new Mayberry, with its cattail mass and deep water, has little to attract waterfowl in winter. My guess is that Mayberry, on average in winter, holds less than one percent of the waterfowl it once did. In other words, when it used to overnight 5,000 birds, it now has less than 50.
especially at dusk as they moved in for a night of feeding. Looks like hunting will be a bit slow during the holidays, but we’ll be out there trying. Sooner or later the hunting generally picks up. Took my own advise and got out duck hunting on Wednesday. The ducks cooperated. Ice around the edge of the ponds was an indication of the temperature and mallards began to lift off the water as I slid my one-man Final Attack duck boat into the pond. My optimism grew as more mallards took off in front of me. I have a hard time remaining calm when this happens. Duck fever was setting in. With five decoys in place and Lola on her stool, I pulled on the jerk string and it wasn’t long before birds arrived. A single drake mallard passed by low from right to left. I followed it with my gun barrel and decided to go for it. Down it went into a thick tule patch. Lola popped off her seat and I got her headed in the right direction. Circling the area where the bird went down, she got wind of it and climbed into the tules. After she found it she stood on top of the pile and refused to bring it to me. With considerable effort I climbed onto the tule hill and grabbed the duck. I had no time to play around. Who knows for sure why dogs do things, but I think she likes to lick the blood that flows from the ducks wounds. Any way, I probably wouldn’t have retrieved it without her. And so it went for the next two hours. When it was over I had six greenheads out of the eight I shot at. Not bad. Most of the shots were close and the birds worked well. They were wary and quite a few refused to come within range. They were in good shape, large bodied and yellow skin – which I consider a sign that they were not yet stressed from the winter weather. Had the local MDF committee over for barbecued ducks last night and the birds were delicious. Lola had a good day retrieving – with a couple minor exceptions. Received a call from a friend in Klamath Falls, Oregon, yesterday. He said the temp was 20 below. Oregon holds lots of ducks until a big freeze happens. Some years it never happens. This is good news for duck and goose hunters as waterfowl has to move when the temps drop. I’d imagine that this will be one of the better duck hunting weeks of the season, with new birds moving in from the north. 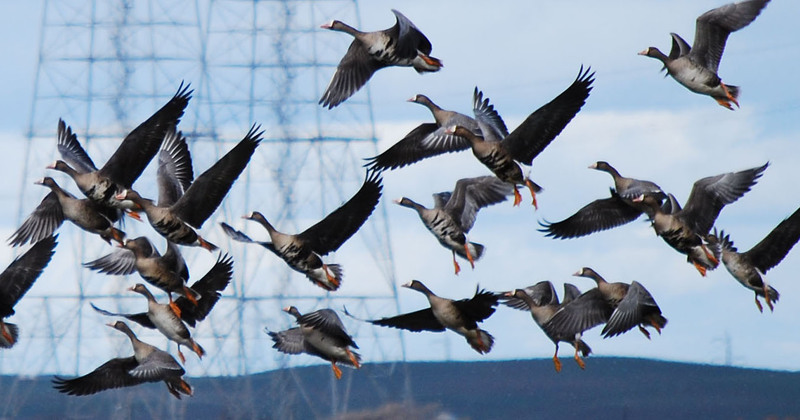 When new birds move in, it takes them a while to learn safe areas, giving duck hunters a chance to bag some birds before then learn to congregate in protected areas. on Saturday I hunted Webb Tract, primarily for geese and there were plenty of them around. The first couple hours were hectic and I bagged on specklebelly before the action slowed – should have had a couple more, but as is often the case, I muffed a couple chances and missed on a few shots. As the wind picked up, the birds used their ability to stay just on the edge of range to their advantage and I missed shots and passed up other shots that I should have taken, but that’s waterfowl hunting. I plan on being out there this week. Don’t miss out on this type of opportunity – it may warm up and leave us wishing we’d been out there while it lasted.